"Oxygen is the third most common element in the universe and its molecular form must be abundant in space," said Bill Danchi, Herschel program scientist at NASA Headquarters in Washington. The Herschel Space Observatory's large telescope and state-of-the-art infrared detectors have provided the first confirmed finding of oxygen molecules in space. 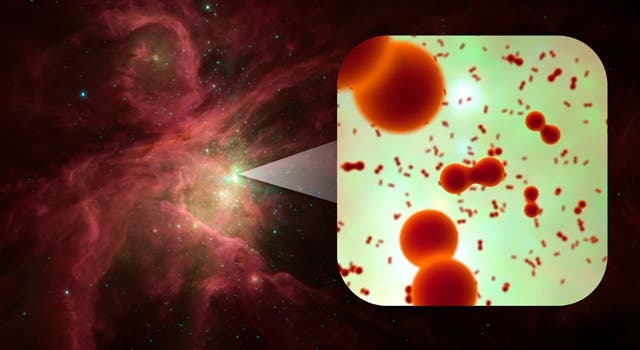 The molecules were discovered in the Orion star-forming complex. Individual atoms of oxygen are common in space, particularly around massive stars. But molecular oxygen, which makes up about 20 percent of the air we breathe, has eluded astronomers until now. "Oxygen gas was discovered in the 1770s, but it's taken us more than 230 years to finally say with certainty that this very simple molecule exists in space," said Paul Goldsmith, NASA's Herschel project scientist at the agency's Jet Propulsion Laboratory in Pasadena, Calif. Goldsmith is lead author of a recent paper describing the findings in the Astrophysical Journal. Herschel is a European Space Agency-led mission with important NASA contributions. Astronomers searched for the elusive molecules in space for decades using balloons, as well as ground- and space-based telescopes. The Swedish Odin telescope spotted the molecule in 2007, but the sighting could not be confirmed. Goldsmith and his colleagues propose that oxygen is locked up in water ice that coats tiny dust grains. They think the oxygen detected by Herschel in the Orion nebula was formed after starlight warmed the icy grains, releasing water, which was converted into oxygen molecules. "This explains where some of the oxygen might be hiding," said Goldsmith. "But we didn't find large amounts of it, and still don't understand what is so special about the spots where we find it. The universe still holds many secrets." The researchers plan to continue their hunt for oxygen molecules in other star-forming regions.